A food journal is useful for many reasons. It makes you aware of your bad eating habits and reminds you of your good ones and it helps you focus on your diet and nutrition targets by offering a daily reminder of where you are and where you want to be. It also allows you to record your thoughts and feelings about food, which can be good clues to why you eat well, or badly, in certain circumstances. If you are on a diet, a journal lets you see when you need to cut back and when you can afford to allow yourself a little treat. Keeping a log of your exercise and activity levels alongside your food intake is instructive and helps you see progress as you lose weight or gain fitness. The simplest way to keep a food journal is to buy a small notebook and jot down everything you eat in a day. It’s a no fuss, and very unobtrusive way to manage your diet. You can either note down your weight and goals at the beginning of every week and chart your progress that way, or sit down at the end of every week and calculate your food intake and measure your weight. If you’d like to do something a little more elaborate, find pictures that make you think about your goals – these could be images of a beautiful beach, a gorgeous dress, a pile of fresh fruit, a couple jogging or whatever else appeals to you. Stick the picture on one page in your journal and write your eating and exercise details on the facing page so that every time you open your journal you are reminded of why you are trying to eat well. A great way to keep a food journal is to draw a food pyramid on each page and simply write in (or if you’re artistic) draw the foods that you eat into the relevant section of the pyramid. If you want to have an ‘at a glance’ guide to when you’ve eaten to your daily pyramid levels, you can just shade a section of each pyramid level for the food you’ve eaten, so a baked potato with coleslaw would count as two of your three to five vegetable servings. Sit down at the end of every week and examine your journal to see how the types and portion sizes you eat match up to the ideals of the food pyramid you are using. 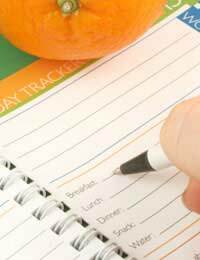 Note where you can make improvements – if you have food groups you aren’t eating enough of, list them at the top of the next week’s journal pages so that they are a priority eating target. If you are overeating in a particular category, put that at the bottom of each page and don’t let yourself eat from that section until you’ve filled some of the others on the journal pages. You can also explore whether you eat regularly, or for emotional reasons, when you’re bored or when you’re stressed – all of which can make a hash of your best attempts to improve your diet. Understanding your responses to food can help you eat better. Studies show that people who keep a food journal, even after they’ve achieved their goals, tend to keep off the weight that they’ve lost, or maintain the fitness gains that they’ve made, much more than people who don’t continue to keep a journal.